The doll in the "dream of the Hunter"
The doll, which locates in "dream of the Hunter", only comes to life when you have discovered the first boss opponent. After that you can upgrade your character there. The mercury balls of in the store are quite expensive with 240 blood echoes per ball. This is probably because these can be very valuable, especially in boss battles. Since you should use it later for important items such as the antidote or Molotov cocktails the blood echoes, you have a "drop" hope in one of the many creatures. This is the center of "Yharnam," and take a couple of shooters. These are only armed with a gun and let the precious balls almost always fall. After a short introduction sequence get character creation. Here you choose next to gender and appearance and the origin of your hunter. This influences the distribution of skill points to attributes such as vitality, skill or strength at the start of the adventure. Now choose a lineage that matches your style of play. Since beginning not sure how you want to go hunting, select the origin of "coward". Here, the points are evenly distributed to all attributes. Choosing wisely, as later in the story, it saves a lot of time (because you have less "farms" to level up certain attributes) and blood echoes (which you will need for the acquisition of essential items, weapons and armor). In the streets of Yharnam some wild trolls drive around. Especially at the beginning, you should take a wide berth. The massive creatures can be found mainly on paths to abbreviations or secret rooms. If you will still involve in a fight, you should keep it ready your Molotov cocktails. Two pieces of it are enough to kill a troll. Alternatively, it differs from the side and placed it behind you. Since the trolls are relatively slow, it may take a while, until they have turned back. Now you attacked the beast and soaked again. So you make the beasts fewer problems. Caution: Do always keep an eye on the weapons of the enemy. Depending on the equipment, the trolls have a different move set. Thus, their behavior changes towards you. With the valuable blood stone shards, enhance your primary and secondary weapons in the dream of the hunter. You'll find them often on corpses or are dropped by stronger opponents. We have discovered a way, as you can always collect blood stone shards. On the way to the third final boss (Blood Hungry Beast). First you go there, you may even encounter five beasts (one surprise attack on the right of the entrance to the church). Each of these beasts you donated a shard. Now back in the dream of the hunter and run back towards boss battle, you can re-grab four blood stone shards. You should die, you can also perform the operation. Now you can enhance immensely or sell the pieces in store for her blood echoes your weapons. Both have their advantages. Access points are always good. One is to buy something for it, or get help when looking at opponents. Too many access points make even simple opponents to a challenge. Eg. if you have 15 points insight you need before up to 6 heavy attacks in Yharnam center for easy opponents. With a score insight about 8, the same opponent has already been done with a slash / attack. For the first time, you will find alone about near the sewage system, even before the first boss. Speak to him and then leave him alone to attack under any circumstances. Later you will meet him again when you have reached the safe cathedral. Go straight through the gate, they should be equal to the left, styling again, and it talks about a prey belonging to it. Unfortunately I can not say whether it is immediately there, if necessary, after each boss fight look again. Now go to the cemetery, where you kill the Father, where you can see them and an enemy fighter, do the hunter and talk to him. Fit on doing them because it is involved in the fight. Did the spider Rome later defeat on, head to the entrance of the room where you kill the boss "vicar Amelia". The lady is seriously injured ahead lies and warn you of a dangerous opponent in the room. Go inside, defeated the hunter and go back to her. As a reward you will receive a badge, which ye can buy their set and also a rune that you can use it to # 4 on the Runes, which greatly increases your stamina regeneration. Tried the quest chain in any case to make as soon as possible because it could happen, that it no longer shows up at said locations. If you want to play together quickly after starting the game with other players, will find that this is not work in Blood Borne at the beginning. Here is a guide to all players who play (or bosses) alone are too heavy, or who simply prefer to have a CO-OP game experience, so want to play as soon as possible together. "A bell of the challenge" and "an inspection point." Both items will get as soon as you get to the first boss in the game, "cleric beast" on the big bridge. You don’t have to defeat the boss, you shall die and then get into the "dream of a hunter" at the top of the stairs next the "doll" a new note, which gives you both items. For those who play up to the 1.Boss not wants a tip: with some practice you can loose to the boss by race and get a very fast access point! If you want to call a teammate, is in the area where you need the help and the bell tolls (as Quick item equip and use). 1 access point is used, if someone comes or not. The good ... the bell remains active and can constantly meet new players, up to a maximum of 3 other players. It is not allowed to change to another zone (loading screen), so do not go back into the dream of the hunter, you must not die !! and do not have internet connection abort, otherwise the access point off and listen to the bell ringing on. You have to start only this a try! If you have little insight points should really wait 2 more players coming to online, and make bosses then only three. The boss fight really let the other go first and always heal well that you do not die. Thus bosses can beat well. Tip: you should fail, it is possible to quickly create a new character the 1.Boss, a new insight point, a new attempt. You should defeat the boss, there are 3 further insight points as a reward, then you have enough points for the next Boss. As far as posible remain online to take advantage of possible bell well. In the sewers, a hidden area of ​​the starting city, there are still to be found 2 items (knowledge of Insane etc) each give an insight point of consumption. If you have after the boss 10 access points, you can unlock a new trader in the dream of the hunter, the 10 point must be kept, where you can buy a small bell with you free of charge at any time shall not offer to op yourself. Helps you to other players with bosses you always get access points as a reward, the problem of the scarcity of access points is then solved! and is free of charge playfully explore an each new level in the coop. 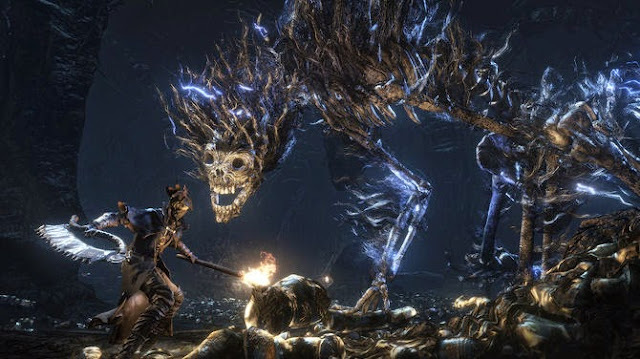 Those who have already done the first two bosses located in the Cathedral District. There exist a closed big gate. (At the top of the great staircase on which a giant, and expires). Behind this gate is the Cathedral's main square, on the 5 items scattered, each giving an insight point! To open the door, you need a logo, which sold the well-dealer in the dream of the hunter, 10,000 for "gold / souls". I have the initial areas until I had 10,000 gold and like me then bought this "Emblem". The 5 points of access s to get around to buy the small Gocke from the second fountain dealer quickly to the required 10 access points. First bought the second small bell, and never had a lack of insight points again. If you have first the little bell, you can always make free Koop, and explore all Level coop. You can buy two for some crazy weapons at the Bad messengers in the dream of the hunter when you kill the guy with the Minigun on the tower in Old Yarnham. Select in the "dream of the Hunter" first the cathedral district from. Of the lamp (spawn), you walk down the stairs first, and keep an eye out for a right door. Go through and take the elevator to the top. On the upper level, you can expect an opponent in wheelchair shoots you balls from his mini-gun around the ears. Softened with a few pike jump to the left or right and do the beast. Back of the room you can now find a chest. Open it to get the "Communion" -Rune. After fighting the Witch of Hemwick, you will find the Rune workshop tool. In the "dream of the Hunter" you can now increase the maximum capacity of your Blood vial by its processes the rune on the tool table. This is a similar item that works like the normal Blood vial. However, the effect is stronger (heals more health). One can get it if you go back in the history of the game back to the infirmary at the beginning of the game. The door is now closed and a woman talking with you when you interact with the door. Speaks to her a few times and you will receive the item. One can only carry with him and you cannot sell or store. This item you can pick up again and again when you talk back to the door. So you always have more Blood vial. Attention: This item must be specially equipped and is NOT activated by [triangle]. To use this route, you will need the lantern for "MERGOS memory: center". Most optimally would also be the lantern at "Lunarium the nurse". In principle, it is quite simple, run from one lantern to another and kill the 3 pigs together with the 7 shadow creatures. A pig brings 9450 and per shadow being there in 2492 (slightly less, depending on the nature of the shadow system). I myself need for this route rather than 3 min. So you'll get for about 3 min (+/- depending on how fast you are) an amount of about 45,794 blood echoes. Even more, if you have rune of type moon, the more you wear them, the greater your yield at the end. Besides, the shadow beings often properly drop each 1-3 blood vial per pig and you'll get 2-4 of them, one can thus incidentally often heal or equal to farm with. 1) It's best to start from the lantern of the nurse, as the opponents thus be easier for you. The 2 wandering pigs notice you until much too late and the one with the fireballs on the increase, is completely surprised. a) Keep yourself away from the cloud that emits the pigs in the roar, they cause incredible what you can do quickly. b) Always remain approximately 1 meter distance from them, so that you can respond well to start counter attacks. c) If they rear up to you to death with their bodies, retreat, self-charge attacks do not interrupt this and it causes very high damage to you. a) First try to kill holding a fireball in hand. b) If you shadow being alone with the sword, with the sword + flamethrower against, you ought to concentrate on holding a sword, as the other more of the opponent is holding the distance. During her beginning still have some problems, it will let you quickly get used to the opponents and practically hardly die. Once you've unlocked the classroom building, you can find there a reading room, which is full of arcane students. If you have your weapon until then been some improvement you can do with a blow students. After you've sorted out in the hall all students, you have received between 12,000 to 16,000 echoes and also increased your total stock of Q-balls. Now you have to return to the hunter dream to go from there back to the classroom building. Since it is the hunter dream and classroom buildings are very small areas, they are loaded quickly and so you can scarce 100 000. echoes within 10 minutes farms! In this guide I will explain to you, by which cup dungeon you have to meet the lady. First, it needs the Pthumeru-cup that her "blood-hungry beast" boss. Do you have this, you have now come by following chalice dungeon in this order, the next cup always from the last boss of the previous cup-dungeon. Then you will find the 5th cup in the 3rd level as the final boss. In the game there are 2 ways to get blood chunks. 1) You put yourself using the root chalices to a depth of 5 and hope that you look through the chest like coffins. 2) There is outside of the cup Dungeon blood chunk, which you can get to you. However, only 1x per run when you start a NG + you can get it to you of course her again. Leverage the fast travel and put yourself to the lantern "MERGOS Memory: Basemap". Get there with a lever on the rock the elevator, which is a cage at the same time. If you're so got to the top, take again the same elevator in which the door is broken. During the ride to the top, you will come to a crossing over, here you have to walk by or roll in. Now just follow the only path, but beware the opponent. This put you on the status of madness. If the bar full, you get extremely high damage. So take some sedative through and enough items to healing. On the other hand in the building arrived, a space comes with spiders, just walk through and down the stairs. Then you will soon see a lever that activates it and then jumps to the left through the hole in the ground. Attention, here again lurk an opponent of annoy you with madness, even if you're not in him close. Run straight ahead (against the spiders) and pass through the single pass, making come back into the open. After a few steps, you will see a small building on the right, arrive through the remains of a wall. Look down to where it sees a big hole. Jump down, but not directly into the hole, but on the platform around the hole where you will discover a corpse. Search and the blood chunk is yours.